New Client & Update Client Released! I am pleased to announce the release of the Handiham Remote Base software release version 6.1! Since the beginning of my work with the Handiham Remote Base software, it truly has been an honor to work on technology that facilitates the use of the W4MQ software for ham operators that are handiham members. This version of the Remote Base client is a springboard release. We believe that this release will enable many enhancements to the remote base right now and in the future. With this release, we are prepared to continue the life-cycle of the W4MQ client through the recently announced Microsoft support of Visual Basic 6 applications. Microsoft, as of November 2012, announces that Visual Basic applications will be supported through the lifetime of Windows 8. This means Windows 7 and 8 are now shipping with common components that enable continuing support for the Handiham Remote Base client. Typically, Microsoft will support a released operating system for five years with an additional five years of extended support. That means we are prepared to have the Remote Base client supported for at least five years if not ten. With this release of Web Transceiver, version 6.1, we have included the following major fixes. 1. Phone Home Bug Fix – Essentially, the Phone Home bug was uncovered and fixed. We now have an interim update that enables one station to be phoned home, the W0ZSW station. Without enabling one remote station to be polled, the remote base client times out on a constant basis and non-sighted users will have no functionality with the client; hence having to shut it down from Windows Task Manager. The Phone home bug fix / workaround is not required with this release of the W4MQ client. For those that have implemented the Phone Home Bug fix, you may remove the HOSTS file entry as soon as the update is applied. 2. Increased Performance – The Web Transceiver software is now faster than ever. The interface is crisper and feels much more robust. 3. .Net support enhancement – With this version, we get closer to the day when the Web transceiver can be converted to the .Net framework. 4. Menu enhancements – The Web Transceiver menu is much more robust and all options now work. There are options that have been removed and new options added as well. 5. Addition of an Exit Option – you may now press ALT+X to exit the Web Transceiver application..
6. Removal of Legacy / Obsolete Code – Much of the obsolete code has been removed from this version of the remote Base client, hence making it much more robust. 7. URL Updates – Many of the broken links within the application have been fixed. The links now work and bring up the correct web sites. 8. Internal Code Improvements – To make the code much more readable and user friendly, this version of the Web Transceiver has been updated to be more readable internally. 9. User Friendly Messages – Application messages are now much more descriptive and provide details on actions that the software will take. 10. Debugging Facility Included – This facility will improve with time and has been added to improve software debugging. As we continue working on enhancements to the remote base client, we hope that our beta team will continue to participate in this great tool for Handiham members and the like. Team, without your help, this release would not be possible. For those of you who will continue on to the next release, thank you for your continuing support. I thank Pat, WA0TDA, and Lyle, K0LR, for leading this effort and for getting me started in this development. Pat, I never imagined that I would be working on this code but when you mentioned you needed help with the remote base, I truly was excited about the prospect of working through the code. For me, it had been a good ten years since I had worked on VB6 but it came back so quickly; it was like knowing how to ride a bicycle, I just remembered. Now I am hooked! Time to work on the documentation and audio files! As we head into the weekend, we are happy to report that we have been making some really good progress on the updates for the W4MQ client software. We now plan to have an update release that will bring current installations up to date as well as a new client for first-time installations. Several bugs were worked out this week. Thanks to everyone on the team and to KK4JZX for doing the heavy lifting with the coding. We are pleased to announce that we are days away from releasing the new W4MQ remote base client version 6.1. With this release, we are including fixes for all known critical issues uncovered in beta versions 6.0.2.0001 through 6.0.2.0007. If you are interested in learning more about “What’s under the hood” with this version 6.1 release, please stay tuned for a detailed update. We have been working very diligently to get this product out the door for the benefit of all Handiham members. Among the critical fixes is the “Phone Home” bug fix which has plagued the W4MQ client for several months now. If you have been running the beta versions, don’t worry, we will be releasing a tool that will remove all existing betas from your computer. In addition to the many updates in version 6.1, we are working on additional upgrades that will enhance the Web Transceiver client to include accessibility support, power level support, and updated Skype support. I have adjusted the balance between the output of the speech frequency announcements and the receiver audio. This makes the received signal louder relative to the speech frequency announcements. Please let me know how this is working for you. Ever wonder what the remote base station looks like? The answer is that it’s surprisingly like a typical ham radio station anywhere, sporting a radio, power supply, and that all-important station accessory: the shack computer. In this first photo we see the Kenwood TS-480HX transceiver paired with matching SEC switching power supplies. 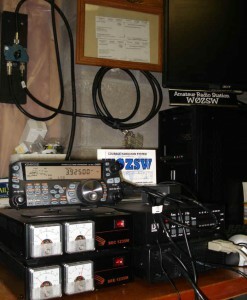 The Systemax rig control computer is in the background, interfaced to the radio with a RIGblaster nomic from West Mountain Radio. The RIGblaster is on top of the antenna tuner, an LDG AT-200PRO. On the wall above the radio there is a board with a two-position coaxial antenna switch that allows us to switch the output of the radio to a dummy load for testing. Our vintage sign, “Amateur Radio Station W0ZSW” sits atop the computer, just beneath the LCD monitor screen. This sign has been in the Handiham radio room for as long as anyone can remember, so it seemed appropriate to keep it in place at the remote base station. Partly obscured by the control head of the radio is a W0ZSW QSL card. The two power supplies are needed to accommodate the TS-480HX’s requirements, since it is capable of running at 200 watts. The same is true of the LDG AT-200PRO antenna tuner. At our sister station, W0EQO at Courage North, the radio is a Kenwood TS-480SAT, which is capable of a maximum 100 watts and thus needs only a single power supply and an LDG AT-100PRO antenna tuner. 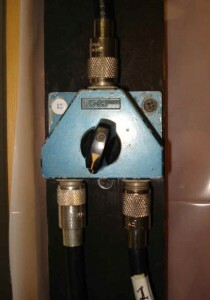 This dual-position switch is mounted upside down, which seemed to be the best way to accommodate the heavy RG-8 cables. George, N0SBU, gave me the switch, and I mounted it on a scrap of pine board for stability before affixing it to an outer wall near the point where the antenna cabling goes through the wall. This switch allows for a dummy load antenna to be placed into the circuit so that testing can be done off-air. 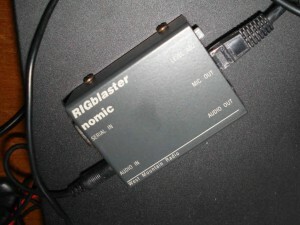 Here is a close-up of the RIGblaster nomic interface by West Mountain Radio. In our installation only the microphone audio is interfaced through this device. Next, we head outdoors, to the other side of the wall above the antenna switch. 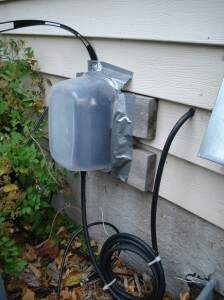 We see the coax exiting the wall and dropping down from the entry point so as to prevent water from following the cable into the wall when it rains. The coax is coiled into a five turn choke coil to prevent RF from following the outside of the coax back down into the shack. Under the plastic radome (really just a poly food container) is a rehabilitated MFJ 4 to 1 current balun. 450 ohm ladderline exits the top and goes out to the center insulator of a 200 foot double extended zepp antenna commonly known as a “W0OXB Special®”. This photo was taken late last summer, so don’t go on the assumption that the greenery on the nearby bush is common in Minnesota in January! 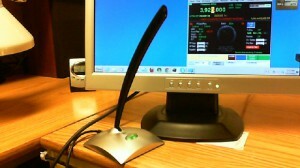 Finally, here is the view from the point of a remote user: The W4MQ screen shows up on a computer monitor and a USB desktop microphone does the honors for voice communications. Remember that there is no microphone at the station itself, since the rig’s microphone port is connected via the RIGblaster to the rig control computer’s sound card. The W4MQ software will also run CW and PSK-31 with its built-in interfaces for those modes.